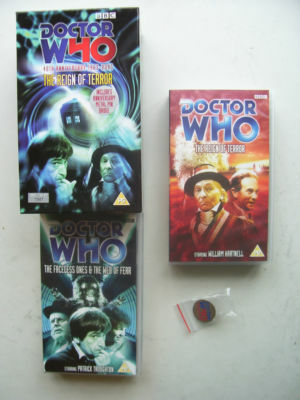 Contains the Four remaining episodes ( 1,2,3, and 6 ) Specially recorded narration by Carole Ann Ford provides links between the missing episodes. While trying to return to London in the 1960's the TARDIS instead takes the Doctor, Ian, Barbara, and Susan to Francein the eighteeth century. The travellersrealise that they've arrived in the middle of the French Revolution- aperiod in history that saw the French nobility and their supporters overthrone. Ian Barbara, and Susan are arrested as traitors, and locked in the Concierge prison, where Ian learns from a dying prisoner about a mysterious spy James Sterling. Barbara and Susan are sentanced to be executed but are rescued before arriving at the Guilotine. The Doctor takes on the diguise of a senior revolutioary and has to outwit Robespierre, the leader of the revolution, in order to try and reunite himself with his companions. But as treachary and double-dealing abound,who can be trusted? Many years after he returned from Tibet with a robot Yeti, Professor Travers is concerned that the Great Intelligence may strike again. London falls to a mysterious web which invades the streets- and the Underground tube System. The TARDIS lands at Gatwick Airport, and The Doctor and Jamie are seperated from Ben and Polly. Polly sees a man murdered, but she goes missing soon after. What is the mystery behind Chameleon Tours? The Doctor and Jamie dicover that not only have Ben and Polly disappeared, but many other people who have departed from the airport with Chameleon Tours. They investgate further, but not everyone appears to be who they say they are!